Polish developer PSP Audioware has been making great plug-ins for many years now, and its VintageWarmer was part of many producers’ introduction to software mastering. The latest effect processor to emerge from its stable is L’otary, a rotary speaker emulation based on the Leslie 122 and 147 speakers which are so closely associated with the classic Hammond organ sound. The idea of course is that you don’t just use it on organs; rather it can be brought to bear on any number of different sounds to add depth, dynamism and interest. In addition to the keyboards you’d expect, guitars and vocals are quite often run through rotary speaker effects to jazz them up – but not just for jazz. If you’ve ever been in the presence of a real Leslie rotary speaker you’ll know that they’re quite remarkable things. Though most musicians would recognise the sound of a Hammond, it’s something else to see the speaker switched on and hear it literally start moving round and round inside its case. It’s one of the few pieces of music equipment that actually has to vibrate and hum like a washing machine to do its thing. 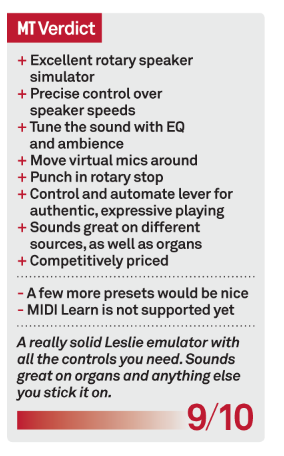 Like a lot of hardware, finding, affording, renovating and storing a real Leslie is massively impractical for most people so it’s a prime candidate for software emulation. 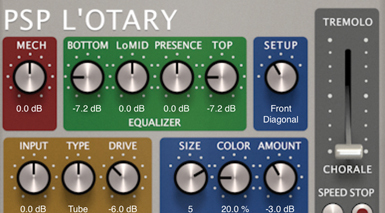 And while most software organ instruments will have a rotary stage, L’otary is a dedicated rotary plug-in that’s designed to be applied to anything you like. It comes in all major formats for Mac and PC and is a small download which is authorised using a licence file. A minimum of an i5-class Intel CPU is required and an i7 is recommended. Realistically you’re not going to be running a modern music setup on a machine much slower than an i5 though there’s a suggestion that some pretty heavy duty processing is going on inside the plug-in. In fact you can switch it from regular to high quality mode, though PSP says this increases sound quality only a little but at the cost of considerably more CPU power. A Leslie speaker has two main components and both are, of course, modelled here with detailed controls. The Horn and Drum sections are located at the top and bottom of the window respectively and have identical controls plus a visual representation of their current speed. There are dual speed controls as well as an Inertia section that sets acceleration and deceleration of the rotation. A Mic section lets you set virtual distance from the cab, gain and cutoff. Both speakers can have their fast and slow speeds set, and the speed lever in the middle of the plug-in transitions between the two of them, with the accel/decel settings determining how long the speakers take to gradually change speed. The idea here is that the Chorale setting is slow and gives an almost chorus-like quality to the signal, whereas the Tremolo setting is much faster and represents more intense rotation. It’s a common technique with the Hammond: when the part you’re playing is supposed to be more in the background, you’ll opt for slower, less noticeable rotation, and when you’re playing lead you whack it up nice and fast so it becomes much more prominent. Set the lever somewhere in-between the two for a more moderate effect, and use that handy speed lever to go straight from fast to slow. The Stop button can also be used to quickly fade the effect, leaving you with a dry signal. One thing that you’ll probably want to do is move the speed lever in real time, since this much better simulates the real Hammond playing style where players move instinctively around the slow/fast spectrum as they play. You could do this by automating the lever in your DAW or by connecting an expression pedal via MIDI and linking it to the control via a second MIDI channel. Unfortunately MIDI Learn, which would simplify this process, isn’t yet supported although it is promised for the future. In the centre are some global controls including a mechanical noise amount dial, four-band EQ, room ambience controls and amplifier input, type and drive. There’s also a Setup dial with five options for altering the mic setup as well as switching into Amp-only mode, bypassing the electroacoustic parts of the emulation. 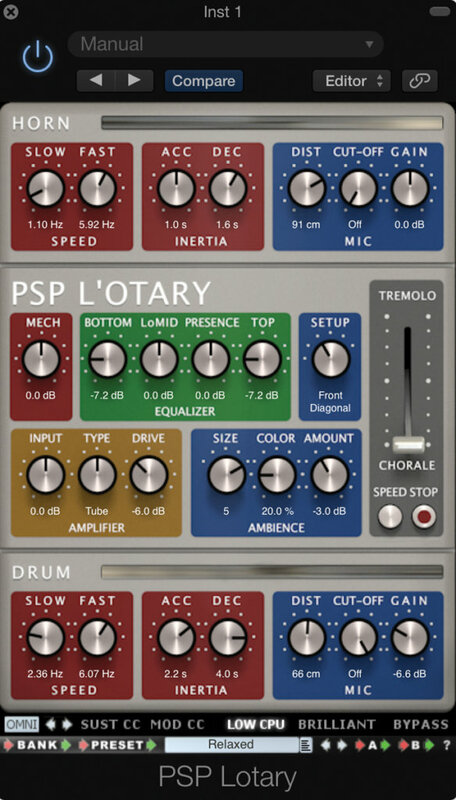 L’otary sounds great, and it’s nice to see a Leslie simulator that doesn’t use skeuomorphic graphics of a real Leslie for once, because frankly they don’t add anything to the sound. It’s also indicative of the fact that this is designed to be used on more than just organs. Of course it sounds excellent on organs, with the various control sections giving you more say over the behaviour of the rotary effect than you might normally get. Having a speed lever and separate speaker speed and acceleration controls means a more realistic Leslie experience, and dialing in some mechanical noise sounds nice and gritty. This stuff all applies to other sounds as well, so you can strategically put it on guitars, vocals, drums and synths and it brings an authentic feel to them. There’s a fully functional 14-day demo available for you to check out.